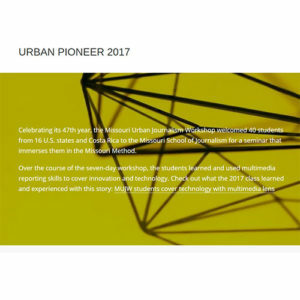 Missouri Uuniversity Journalism Workshop participants may have their work published on the MUJW Urban Pioneer website and in the School’s professional, award-winning news outlets. Discover the fast-paced world of professional journalism! Learn how to cover issues, news and current events. 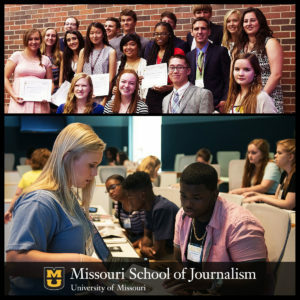 Your instruction will be guided by faculty experts at the Missouri School of Journalism and industry professionals. Mobile Technologies: Learn how to interview sources, shoot video, take photos – do everything you need for your story – while you’re on location. In today’s world, journalists can work from anywhere. Social Media: Use Twitter, Snapchat, Facebook and other social platforms to engage with the public, gather information and more for all stages of your reporting. Documentary Journalism: Go beyond day-turn reporting and try your hand at long-form storytelling. You’ll learn new investigative and technical skills in this exercise. Data Journalism: Dig deep into publicly available information in government databases to discover facts and statistics. Learn how to produce graphics that visualize the information for the public.